…either in person or by Skype. Speaking at book clubs is intensely gratifying for me, and adds depth to the book for the members. 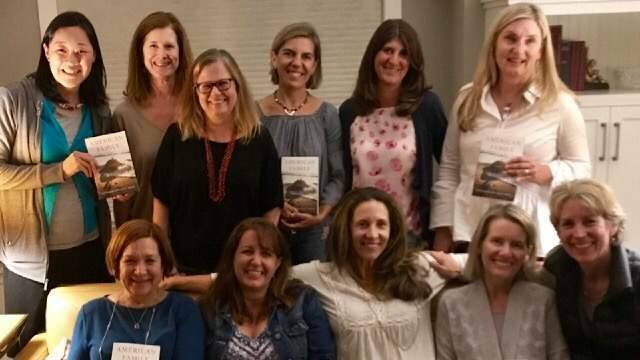 I write with the intention of being read and it is at book clubs that I get to meet readers. I always ask for the format of your meeting. Most begin with chatting about their lives, family and travels and then they get around to the book. I can be present for this or I can come a little later, both have worked in the past. I can speak briefly at the beginning and discussion can follow or the hostess can begin the discussion. Is Richard being responsible or selfish when he decides to contact Brady? If he doesn’t make amends for not being present in her life especially at the time of her mother’s death isn’t he still being a deadbeat dad? Or is he just assuaging his own guilt? She is okay with her grandparents and without him. When Richard and Michael are fighting about whether or not it is a good time to contact Brady, Richard asks, “If not now, when? She’s going to be a teenager soon and emotionally shut down.” When would have been a better time to contact Brady? Did it have to be right when they had just moved in together? Is Richard using Michael to make himself appear more financially secure so he stands a better chance of gaining custody of Brady, or does he really love Michael? Was Brady trying to break Richard and Michael up when she told Michael she blamed him for Richard’s being gay; or was she just being a naïve kid? In both the states of California and Oregon the law presumes that biological parents are always acting, “in the best interests of the child.” Who is the more meaningful parent to a child, the one who raised her or the biological parent? Are the grandparents homophobic or just people of faith? If you are brought up in the church and taught that homosexuality is an abomination, is excluding gay people still bigotry? The scene where Tom is in drag has caused some discomfort among readers. I have been asked if I ever considered deleting it. I put this scene in to show how misunderstandings can lead to prejudicial interpretation of the law. It almost destroyed this family. Still, did the scene in the basement go too far? The court mantra is to operate “in the best interests of the child.” But children don’t hire lawyers. I wanted to show how a custody case looks to a child. People tend to think joint custody is the best solution in the case of divorce and for the parents it is. The kid just wants the family to stay intact. Brady loved all four of the people who were fighting each other for her. But it was painful for her too. Did this give you a different perspective on child custody battles? The ending has been criticized for having “too much sunshine,” or going the way of, “and they lived happily ever after.” I felt that my characters had suffered enough, particularly Brady, and I wanted her to be happy. Was the ending too sentimental? What would have been better to be more realistic with a tense stand off between the two couples with Brady in a prisoner exchange situation? More discussion questions are located at the back of the book.